14 players; groups of 2. 1 ball per group. The groups pass and move throughout the field x 60 seconds each round. 1. Inside foot pass. Emphasize firm overhit pass, getting weight through ball. 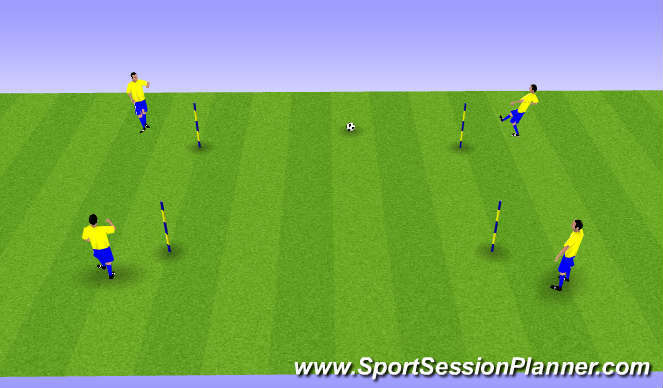 After receiving ball, dribble into space then perform a stepover and find partner. 2. Progress...Inside foot pass; receive with sole. Dribble into space and perform stepover. 3. Progress...Inside foot pass; dump to partner with 1 touch sole pass. Dribble, stepover and repeat. Switch roles after 60 seconds. 4. Progress...Inside foot pass; receive with sole and spin to "face-up" defender. Dribble and stepover. 5. Progress...Inside foot pass; dump to partner with 1 touch sole pass; receive with sole and spin to "face-up" defender. Dribble and stepover. 2- 8 x 8 grids. Groups of 7. Passing square. 1. Start counter-clockwise. FIRST, check hard down line, then passing with right foot; receive with left foot...spin ball to play to next teammate with right foot. DO NOT FOLLOW pass (just change with other player at your pole). Introduce movement in the 2-2. Step 1: Player 1 passes to player 2. Player 2 receives with sole of left foot. Player 1 follows pass. Step 2: Player 2 dribbles towards Player 3. Step 3: Player 2 passes to Player 3. Player 3 passes back to Player 2. Player 1 should now be offering support to the left of Player 2 (this will now look like a 3-1 formation). Player 4 runs around pole to recive ball in the center of the grid (giving a penetration option to Player 2. 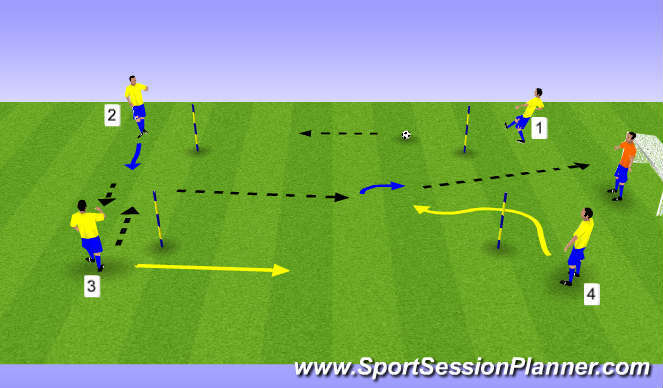 Step 4: Player 2 passes (one touch, if possible) to Player 4. Step 5: Player 4 receives with sole, spins to "face up" goal...then finish. Player 1 and Player 4 push up to join attack (this will now like a 1-3 formation). Step 5: Rotate...Player 1 to 2; Player 2 to 3; Player 3 to 4; Player 4 to 1. 3 teams of 4 + 2 GKs. 1. Games to 1. Winner stays on. 2. If scoreless after 3 minutes, the team on longest leaves. 3. Play first to 4 games. We played again, first to 2 wins.